Indoor camping meets Such Great Heights! At the beginning of August, the Babyology team visited Kids Instyle, an expo of all the newest designer gear for children. When I first walk in to any tradeshow, the noise, lights and general level of excitement can be so much that you don’t know where to begin. 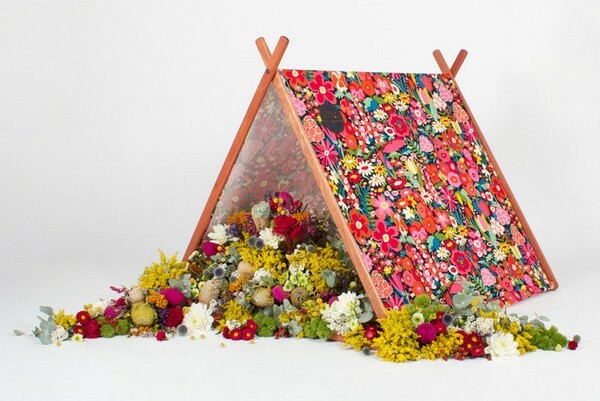 However, at Kids Instyle, I knew exactly where to start when my eye settled on one particular gorgeous floral tent. Known as the Wonder Tent and made by the clever folk at Such Great Heights, the Wonder Tent is indeed wonderful. Beautifully crafted from Australian hardwood and available with a variety of printed cotton canvas canopies, the tent makes for stylish indoor camping. It’s hard not be wooed by the bright floral print but there’s also animal print, on-trend geometrics and a traditional khaki canvas. And for a truly wonderful touch, Such Great Heights also offers a nifty Conversion Kit that turns your tent into a practical and lovely clothes rack (perfect as the place to store dress-ups for easy access). Accessorize your tent (or your backpack) with Such Great Heights’ sweet cloth patch merit badges, commemorating achievements such as bike-riding, sleeping in a ‘big bed’ and making friends. The Wonder Tent is $299, individual canvas canopies are $89 and the Conversion Kit is $45. Such Great Heights deliver Australia-wide.